Okay, NOW they can call the game Guitar Hero III: Legends of Rock. 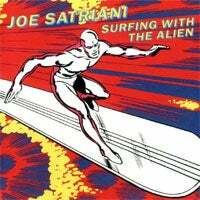 How did Activision get away with this for so long without including Joe Satriani and Steve Vai? We probably should have set the company on fire for this gross oversight, but it's too late now. In two days Satriani's "Surfing with the Alien" and Vai's "For the Love of God" will be joined by Buckethead's "Soothsayer" to create the Guitar Virtuoso Track Pack, barely giving us time to gather enough pitchforks and torches to form an angry mob. We always miss the good angry mob moments, don't we? The Guitar Virtuoso Track Pack will be available July 24th via PlayStation Store and Xbox Live Marketplace.